That long term resident the bull. With docile splendor at its full. This behemoth doth really glare. You'll find real quick you have been gored. I preached on giving yesterday. It wasn't as difficult a topic to discuss as I originally thought. I have heard pastors before talk about the difficulties of giving. What I actually learned was that this topic is very natural to the very essence of who we are as Christians. The sermon ended up being a tad bit on the long side, but I will attribute that to the fullness of this topic. Frankly, I barely scratched the surface of what needed to be discussed. You can also download them by right-clicking here and choosing to save the mp3 file. As a little disclaimer, I felt very much, as I was preparing this message, that my logical flow of thought was a little off. To some, this may not be an issue, but for some reason, I always feel like I need a precise logical flow. When it doesn't come together logically, I always feel a little off when I am preaching. For me, it is sometimes difficult to distinguish the difference between the tangible presence of God's Spirit while studying and the presence of a logical flow of thought. Though I am sure this is not the case for everyone, it is true for me. 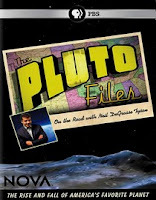 In this installment of "Nova," Dr. Neil deGrasse Tyson (director of the American Museum of Natural History's Hayden Planetarium) dishes out surprising facts about Pluto, the notorious "ex-planet" that so many people still seem to love. Discovered in 1930, Pluto was demoted to a mere member of the Kuiper belt in 2006. But passionate opinions -- and emotions -- remain about its place in our universe. A word of warning, since this topic deals with cosmic objects, it also jumps into cosmic origins. Since this program is secular in nature, their default position is to determine the origins in a universe devoid of God. Personally, I have never shied away from opportunities like this. It gives me the availability to teach my children some of the inconsistencies of the naturalistic theories of origins. What always amazes me is their ability to perceive those problems on their own. Anyway, if you are already a Netflix subscriber, then I would like to recommend this movie.